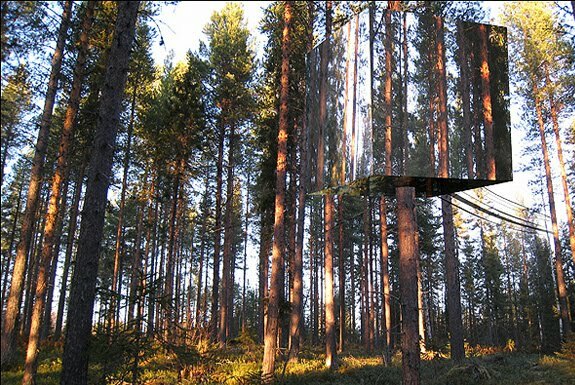 CRAZY tree hotels in Sweden: mirrored, virtually invisible and $4200 per night! Okay, so there’s been some pretty insane hotels built. In Sweden, they built the Ice Hotel, Turkey is home to the Cave Hotel, and Fiji has an Underwater Hotel. But a new crazy hotel was opened this summer. It’s called the Tree Hotel in Sweden. And it’s…really quite insane. Unfortunately, what the price doesn’t include is a fourth wall. 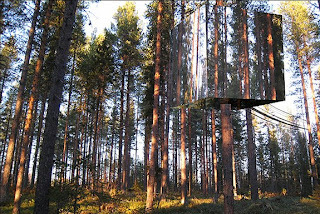 To prevent birds [from] colliding with the tree hotel, an infrared film, visible for birds only, will be laminated into the glass panes. Phew. That would be a very expensive stay to hear birds slamming into your room all day. But if that crazy design wasn’t enough for you…there are a total of six, you heard me right, six different designs done by six different architects. 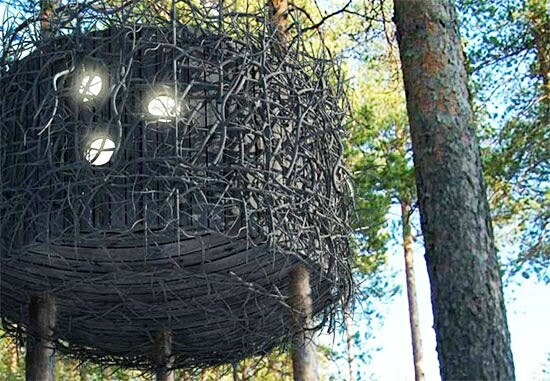 This room is called the “Bird’s Nest”. It’ll run you $3,800. You still get breakfast. This one isn’t quite as cool as the others, but it’s pretty cool nonetheless. This room also costs $3,800. This is pretty much the coolest hotel ever. Other rooms include “The Blue Cone”, “The Cabin”, and “A Room With a View”. The hotel is rounded out by a “Tree Sauna”. And while most businesses ask “Why?” rather than “Why not?”, I’m sure glad they went with it. Because these rooms are super-uber-awesome cool.